Shadows add depth and contour to features. Shadows can "thin" a round face or hide a double chin. Skillful application will distort a youthful face into a believable old age character for film or stage. Note: use highlights and shadows in tandem for old age effects. 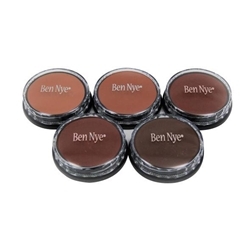 Shadow Wheel (SK-3) Includes Shades: CS-2 Creme Brown Shadows Medium Brown, CS-3 Creme Brown Shadows Character Shadow, CS-4 Creme Brown Shadows Dark Brown, CL-11 Creme Colors Cinnamon. Please note that CS-1 Subtle Brown has been replaced with CS-11 Natural Brown and CS-2 Medium Brown has been replaced by CS-21 Contour Brown.